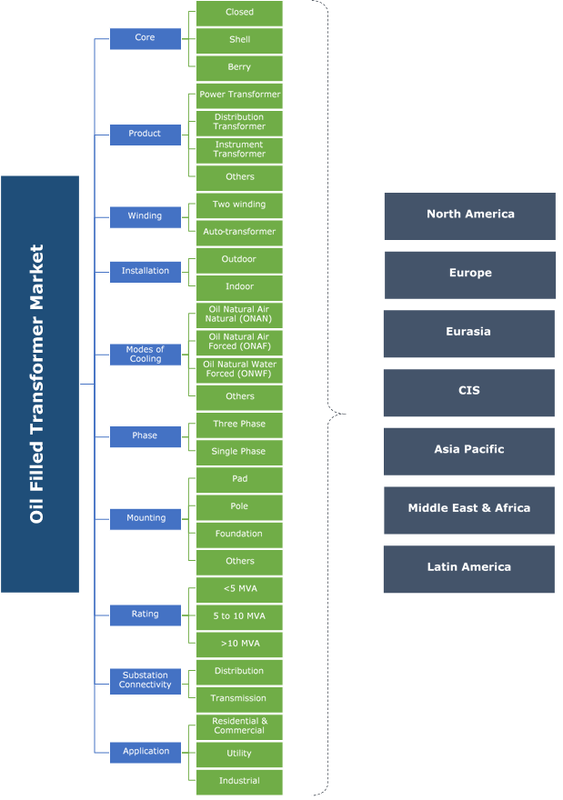 Oil filled transformer market size was valued over USD 33 billion in 2017 and is set to witness an annual installation of 600 thousand units by 2024. Increasing expenditure toward the modernization of electric infrastructure has enhanced the development of effective grid systems thereby driving the market growth. In 2016, the U.S. DOE under the Grid Modernization Initiative invested USD 220 million to revitalize the power grid thereby making it sustainable, resilient, and affordable. Rising electricity demand attributed to expansion of industrial and commercial establishments will further complement the industry landscape. Refurbishment of ageing grid infrastructure in developed nations to meet the increasing energy consumption along with enhanced inclination of government authorities toward the establishment of renewable networks will boost the global market. The Sustainable Energy for All initiative, undertaken by the World Bank has committed to achieve access to electricity universally by 2030 with an investment of USD 37 billion per year for the extension of traditional electric grid. Development of HVDC networks to meet the constantly increasing electricity demand will drive the shell oil filled transformer industry. Extensive application of shell transformers across higher power ratings and higher voltages will in turn boost the product adoption. These transformers are designed with inherently better kVA to weight ratio, higher immunity to transit damage and better short circuit strength characteristics. Rising need for an efficient transmission system to ensure reliable power supply will fuel the oil filled power transformers market. Positive inclination toward the expansion of high voltage lines to cater the surging electricity demand across developed economies along with rapid installation of utility based HVDC infrastructure will further propel the industry landscape. Auto oil filled transformer industry is set to grow over 5.5% by 2024. Utilization of single winding per phase along with lesser current requirement will enhance the product penetration. Improved efficiency, compact structure, and cost-effectiveness of these units in comparison to their existing counterparts will further stimulate the industry growth. Outdoor oil filled transformers will witness growth on account of its ability to operate at high voltage application areas. Optimum cooling strength along with elimination of concerns pertaining to fire hazards will boost the deployment of outdoor transformers. Oil Natural Air Natural (ONAN) oil filled transformer market will grow on account of its extensive application in low rating transformers. The ONAN mode of cooling employs natural convection process for cooling the oil by the circulation of natural air. Favorable regulatory policies for the upgradation of small-scale industrial sector across developing economies will boost the adoption of three-phase transformers. Capability of three phase transformers to operate smoothly over voltages transmitted over long distances along with their economic feasibility will further stimulate the product adoption. Expansion of rail & road networks in developed regions along with massive investments across the transportation sector will appreciably enhance the deployment of pad mounted oil filled transformers. Rising infrastructural investments across electricity markets coupled with rapid expansion of utility aided distribution networks will further fuel the product adoption. <5 MVA oil immersed transformers will grow on account of rapidly increasing electricity demand across residential & commercial establishments. Increasing demand for the designing of compact and energy efficient transformers across primary and secondary distribution networks will further augment the industry landscape. Ongoing expansion of high voltage grid infrastructure across utilities to fulfil the ever-rising electricity demand will augment the transmission oil filled transformers market. Increasing government measures to mitigate the risk of widespread blackouts will further promote the deployment of smart transformers in distribution lines. Utility oil filled transformers market is predicted to expand over 5% by 2024. Increasing R&D expenditure toward the refurbishment of grid infrastructure along with massive fund allocation by regulatory authorities for the expansion of grid networks will boost the industry landscape. The U.S. market is expected to reach over USD 6 billion by 2024. Ongoing technological enhancements along with increased spending for the development of long-distance electricity networks will boost the oil immersed transformer market. In 2017, the U.S. Government spent USD 10 billion for the development of new grid networks, with an aim to reduce the curtailment rate of the Western transmission network. Extensive deployment of smart transformer units coupled with ongoing regulatory initiatives to cater the rising energy demand will drive the France market. Increasing government funding in line with large-scale renewable integration for effective energy mix will further complement the industry outlook. Lack of grid infrastructure across war affected nations along with the increasing electricity demand will accelerate the Middle East & Africa market growth. Increasing private funding from financial institutions toward electrification programs will considerably enhance the business landscape. Eminent industry players across the oil filled transformer industry comprise of ABB, General Electric, Siemens, LSIS Co., Eaton Corporation, Celme, Ormazabal, Schneider Electric, Elsewedy Electric and Toshiba Corporation. To suffice the industrial competitiveness, inorganic growth expansion strategies coupled with extensive R&D has been the foundation for the development of efficient transformers by industry players. Oil filled transformers are transformers whose windings and magnetic circuits are immersed in oil that has good electrical insulating properties to block the flow of current through the oil and efficiently removes heat from the core and windings.